Here's the destroyer, the osprey, and the weather control device, all ingame. 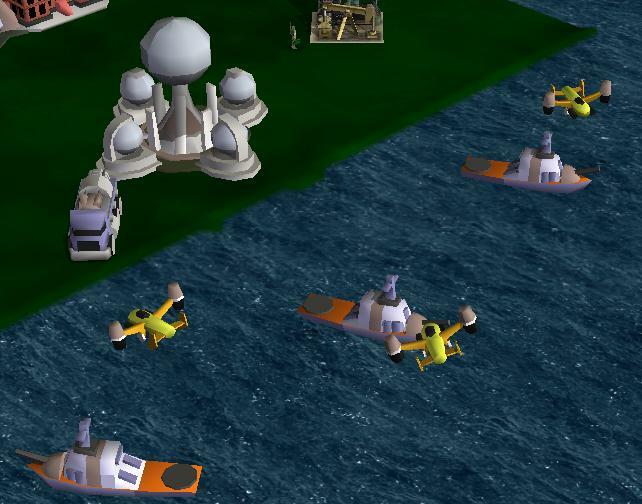 We're working on getting naval warfare into the game, and it's a rough battle. Lots of stuff is buggy, and alot of it is fudged logic. For example, torpedoes don't exactly like to hit their targets, and instead like to travel to the bottom of the sea, right below their intended targets. But we're trying. Some logic just can't be implemented, such as the aircraft carrier. Somewhat related, is the destroyer's Osprey. What you see below is the osprey behaving like the Hellfire drone in ZH. It just flies around the destroyer, and attacks whatevers around it that it can. I'm still deciding how it should be done in the end, but how I described it is probably near the upper limits of what can be done, besides things inherent to balancing. IIRC the Blitzkrieg mod or something had functional ACC coding...I'm not sure, it was just something I heard.